Home » Data Science » Blog » Data Analytics Basics » What is Docker in Linux? Docker is an operating system level virtualization program that is developed by Docker Inc. It was purely written in Go programming language. It was licensed under Apache License and freemium software as a service in the form of binaries. It supports several platforms such as ARM in different versions and Windows, UNIX based operating systems. Docker was initially released in the year March 2013. The source code of Docker is hosted on Github repository. Docker is an OS-level virtualization software and it supports Linux and Windows operating system. To use Docker on Linux, Ubuntu instance has to be used. Correct Linux kernel version has to be ensured to present before installing Docker on Linux operating system. Docker also has a Docker Registry hub that has a list of services before using it. How to use Docker on Linux? 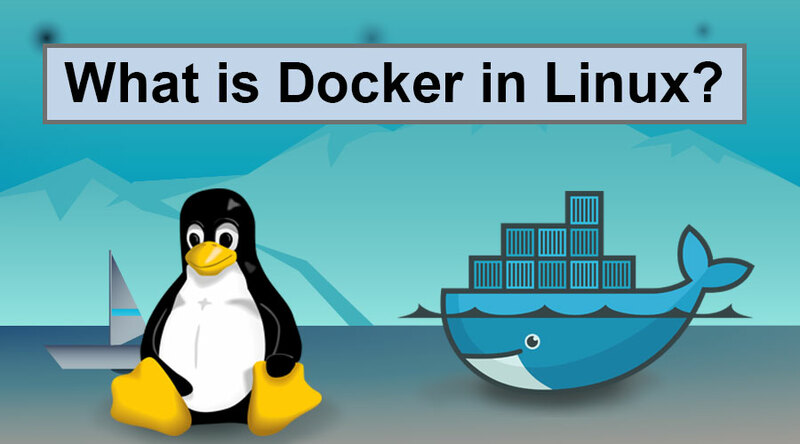 Docker can be used on Linux once the installation of the Docker is completed on the Linux operating system. To use docker there will be few docker commands to be run. To run docker services, use docker run <service-name> command. All the docker services are based on Docker images. Before running any service, it needs to check the Docker image configuration correctly. How does Docker in Linux make working so easy? Docker has several components in its architecture like Software, Objects, and Registries. The process and container objects in the Docker are maintained by Software component. Objects are the group of several entities that will form together as a Docker application. It simply integrates the complete application as a one. Docker on Linux can be functioned by following few steps of installing the Docker software in Linux operating system. The installation process and usage of the Docker Software can be handled by using the command line option on the Linux operating system. Before running the installation commands to install Docker on Linux. All the necessary upgrades are to be checked before installing. Also, make sure that the server’s kernel is upgraded, a reboot if required can also be carried out. What is the use of Docker in Linux? Docker uses less space in the form of containers. It has a very less bootup time. It automates the deployment of applications inside the Linux operating system. Docker has a CLI command tool which can be used inside the Linux in the form of commands. The scope is very good and can be integrated or maintained easily compared to the other operating systems or platforms. Docker has an API in its form to maintain the containers. The containers will hold the actual applications to run them as on host environment. Linux has its own containers in its architecture and in its Linux kernel features. The Linux architecture has great components in maintaining the utilization of resources. This is similarly compatible with the Docker containers in deploying and maintaining the applications efficiently. In Linux, groups, and namespaces together constitute as Linux Containers. Linux containers work as system level virtualization to run multiple numbers of Linux systems on a single host system. Docker has containers and they are maintained in the form of images as their configuration files for the applications in the containers. The docker containers are normally created from the docker images to run the applications. Why do we need Docker in Linux? The Docker has a Command Line Interface Tool which is useful while used in conjunction with Linux. It has greater compatibility in deploying and maintaining the several types of applications in Linux based platforms. Docker is easier to use on Linux platform. It is lightweight and easier to maintain. The containers in Docker enables isolation and remains as separate applications with each separate image in its host environment. It has portable features in maintaining its applications. Linux supports containerized based runtime environment which is similar to the Docker containers. Hence it is easier to use Dockers on Linux. Docker enables to run the containers either on Linux or Windows. The usage of the Linux containers to perform the application’s deployment is called Containerization. Containers are easy to use, flexible and portable to use. Docker runs on top of the host operating system where all the containers sit on top of the Docker. Who is the right audience for learning Docker in Linux technologies? The right audience for Docker technologies is Developers, System Engineers, System Integrators and Full Stack Developers who are willing to learn the latest technology called Docker that is used to containerize the applications. Anyone who is an interested or any student from programming or technological background or computer science background is the correct audience to be considered for this course on Docker technologies. Any programmer or developer or architect from any technical area are best chosen for this course. Most of the software developers or application programmers are considered to be the right choice for these Docker technologies. Docker is the latest containerization software which is available in the current industry. It helps in increasing more efficiency and scalability of applications including high availability. Any software application or products or web application can be developed using Docker either on Windows or Linux operating systems based on the requirements. Docker was primarily developed on UNIX. The docker applications will have a lot of benefits in running and maintaining web applications.